Day 15 – Make something inspired by an important teacher in your life. Bud Webster was, has been, will always be one of my favorite teachers. He led a writer’s critique group of which I am still a member, even though he’s no longer with us. Bud was genuinely passionate about the written word, brilliant and funny as hell. I did my best to capture his quirkiness. A sad smile tugs at my mouth every time I pull this image up. I posted it almost immediately to his fan page on Facebook. But, somehow, it never made it to my blog. Day 25 – Break something and make something new with the parts. 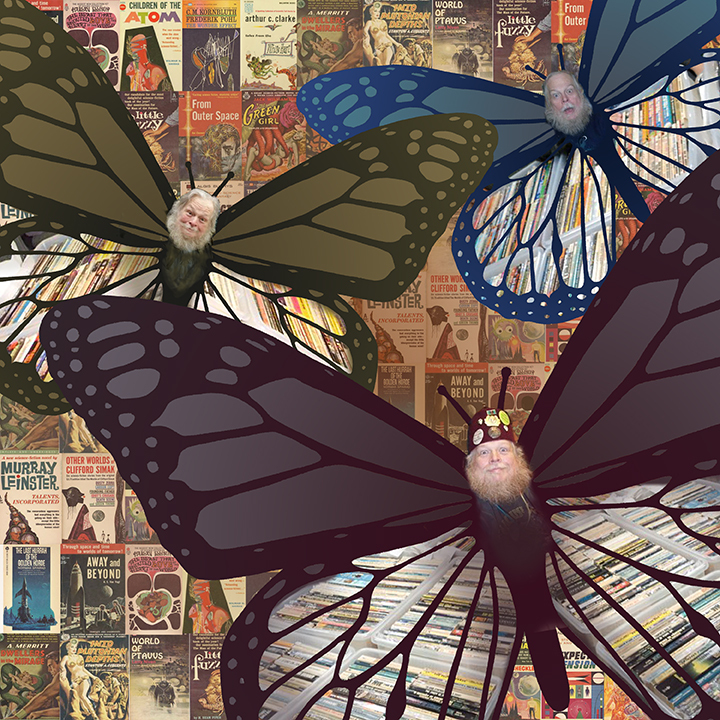 I “broke” apart several digital butterflies and made a new Frankenstein butterfly with the parts. What’s a lonely monster to do…? 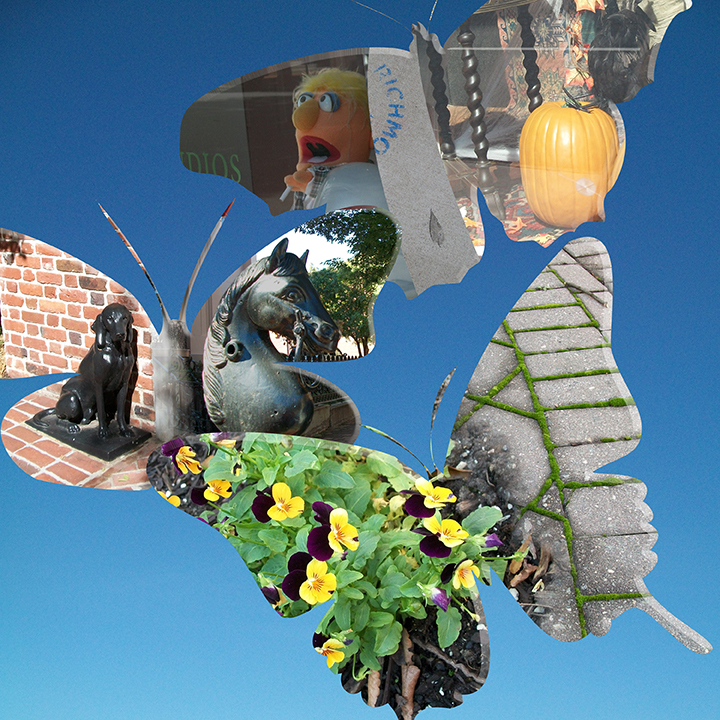 Day 24 – Make something that incorporates or is inspired by a smell. Not many things smell better to me than a loaf of bread fresh from the oven. 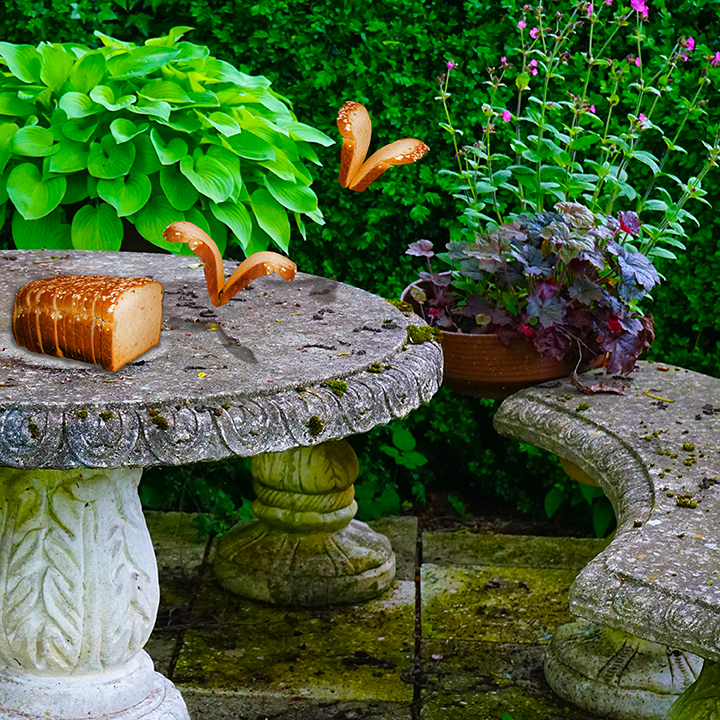 So, with a nod to Lewis Carroll’s, Alice in Wonderland, I can’t help but submit my version of fresh baked bread and butterflies. Day 23 – Interpret your favorite song lyrics. I have a lot of favorite songs. Good Day Sunshine by the Beatles captured my inspiration for this challenge. I’m so proud to know that she is mine. Day 21 – Take something boring and make it really fancy. 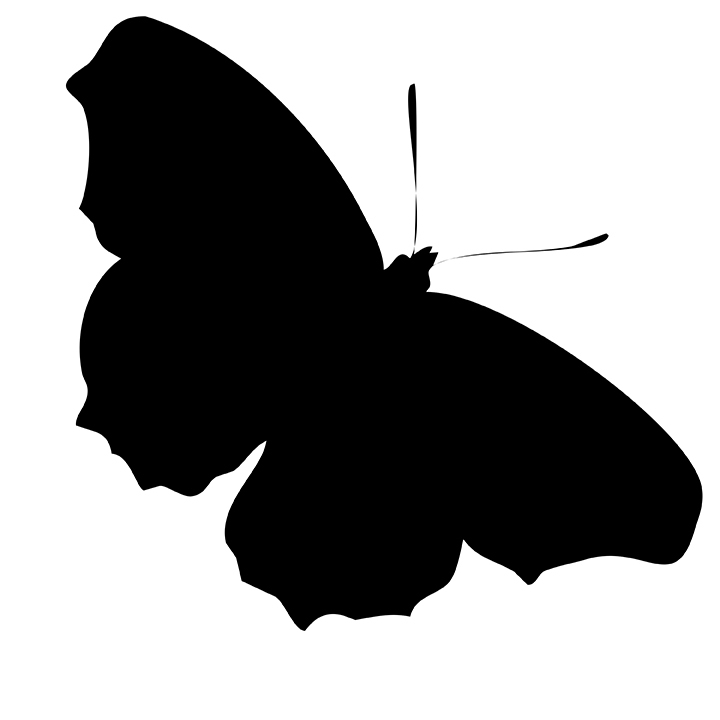 I started with a basic (boring) butterfly shape in black and white. Then I added background layers, lace textures and a string of pearls. 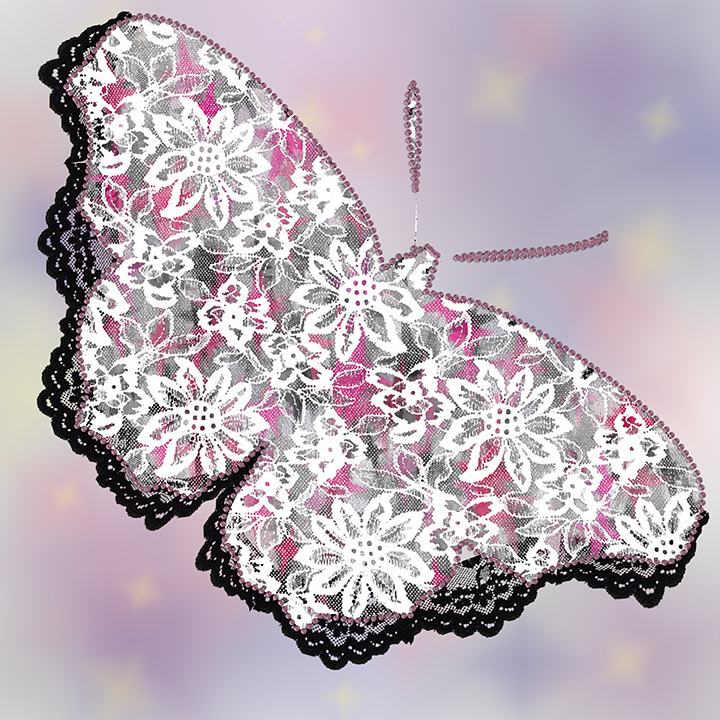 Voila, a “fancified” butterfly. Day 20 – Create using only materials you can find in a kitchen. 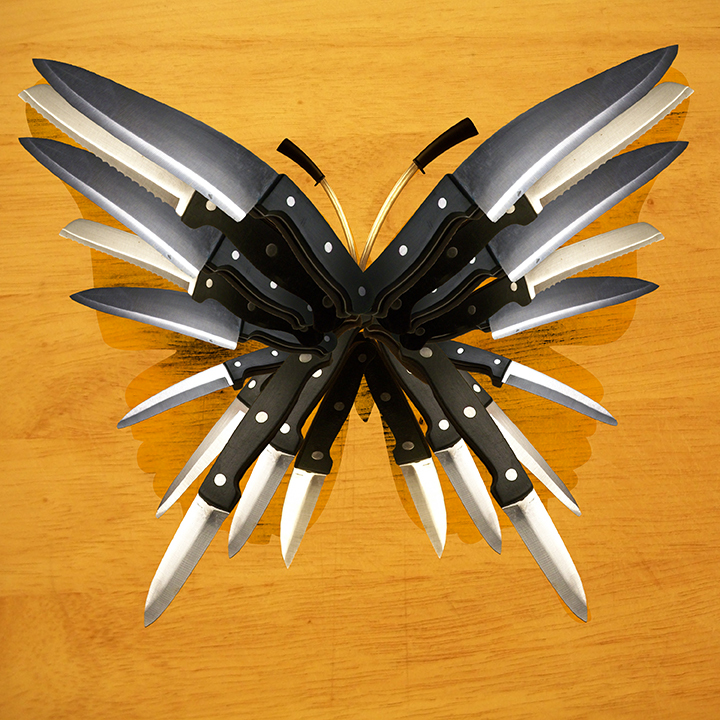 I don’t know if it’s because it’s getting close to Halloween, I have an aptitude for chopping things or I’m feeling a little edgy..but I’m totally feeling the knives for this one. Day 16 – Invent a new word and illustrate or demonstrate its meaning. 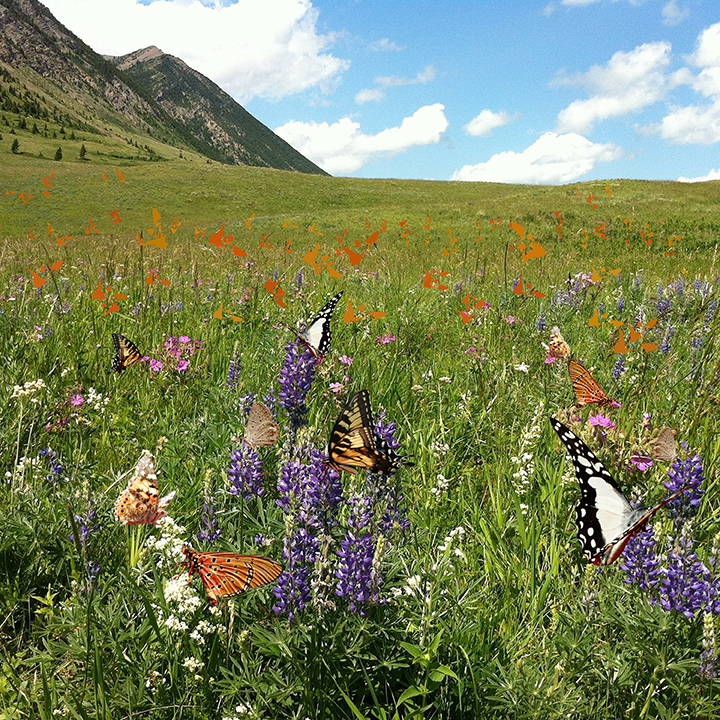 Bucolepidopteous – descriptive of a a beautiful pastoral setting filled with butterflies. Bucolic – adjective: of or relating to the pleasant aspects of the countryside and country life. 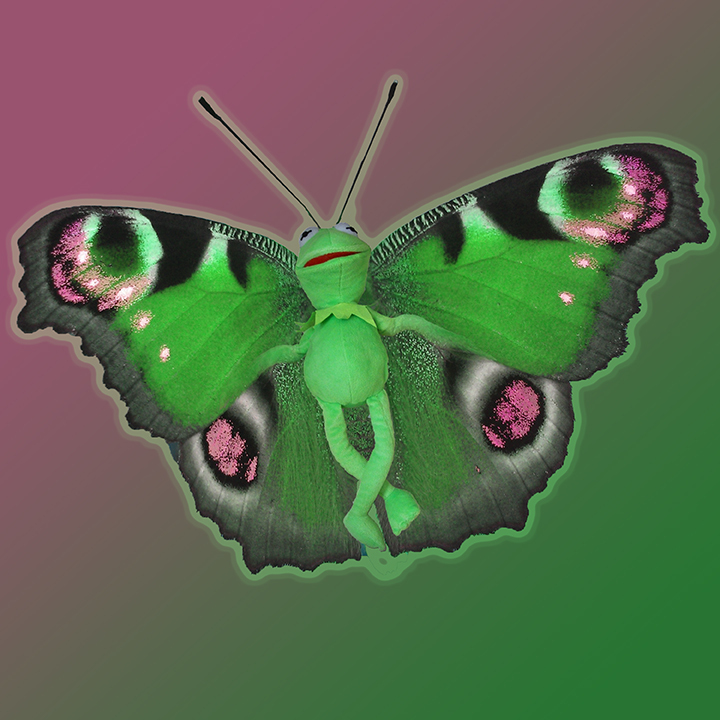 Lepidoptera – is an order of insects that includes moths and butterflies. Day 18 – Take a walk outdoors and create something using exclusively the materials you find along the way. Day 17 – Green is the color of so many different things. 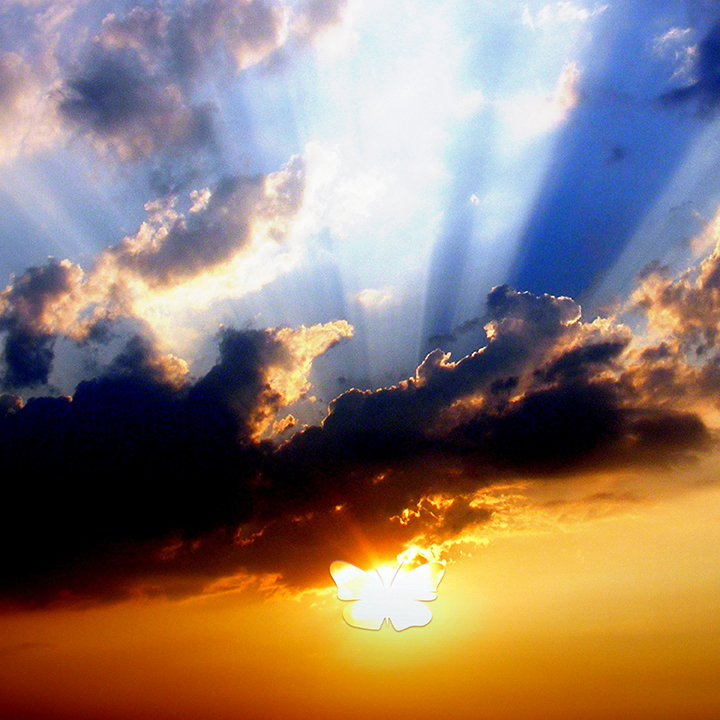 Use it as your inspiration today. Day 14 – Combine two things that you don’t usually find together. 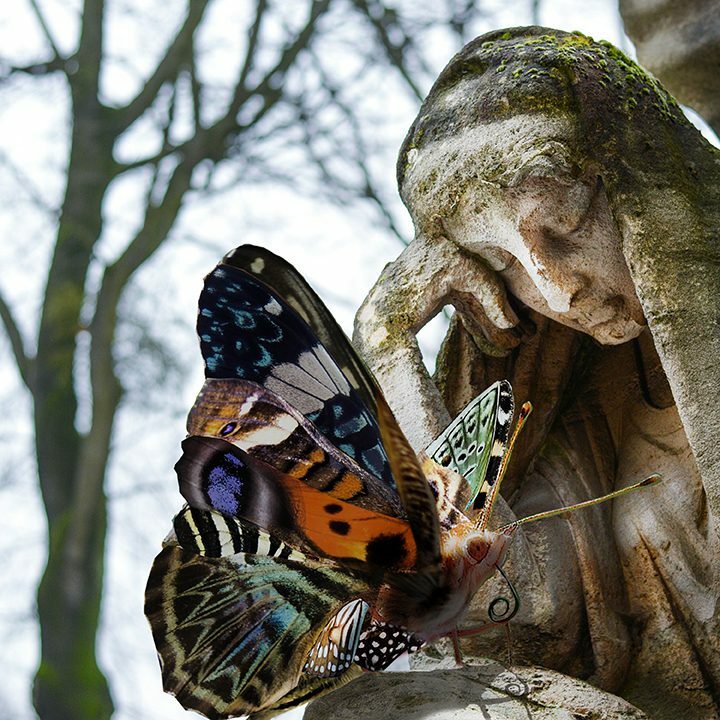 Things that don’t go together…hmmm…but butterflies go with everything right? 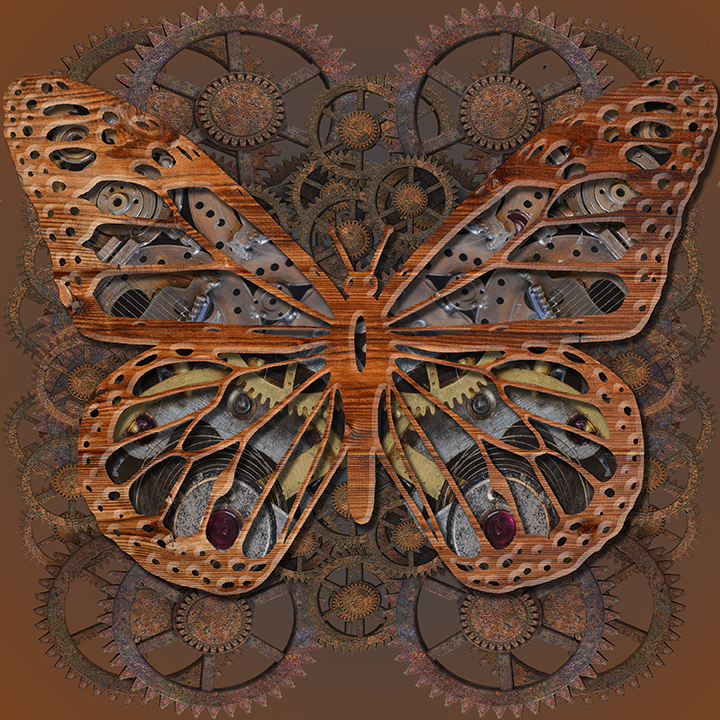 Since butterflies are found in nature, I decided to use something that was man-made and ended up with clockworks and gears for a Steampunk inspired butterfly.